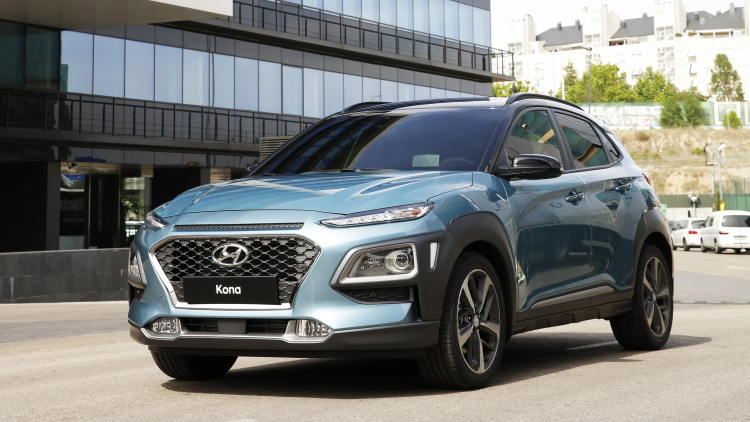 Disclaimer: We were limited to a short 10-minute drive at Hyundai’s research and development facility in Namyang, about a 90-minute drive from the South Korean Capital of Seoul. The closed loop didn’t provide much in the way of road variation, and we reached a blistering top speed of 45 mph with all of three opportunities to use the brakes. The Kona we drove was a Korean-spec model. Suspension and steering tuning will be adjusted for the US, though we couldn’t get a clear answer on what sort of changes that entails. Expect the US model to be a bit softer than what the Koreans and the Europeans will see, though we’ll have to wait until a full first drive to be sure. We got our first look at the new model at Hyundai’s new Motorstudio, a place that’s half interactive museum and half high-end conference space. The Kona’s styling, a mix of original and derivative design elements, is sure to be divisive. The most standout feature is the plastic cladding that comes in either black or grey, depending on the body color. Hyundai is calling it armor. We just hope it’s affordable to replace. The Kona is available with either a naturally aspirated 2.0-liter four-cylinder paired with a six-speed automatic or a turbocharged 1.6-liter four-cylinder paired with a seven-speed dual-clutch transmission. Both engines can be paired with all-wheel drive. The only Kona we tested was an all-wheel-drive model with the 1.6-liter engine. At low speeds, it exhibits the same sort of hesitation as other Hyundai and Kia products with the same powertrain. It’s not great, with power taking a moment to kick in while the clutch engages. Once it does, the Kona gets up and goes. Hyundai reports a 0-62 mph time of 7.7 seconds, genuinely quick and better than the Fiat 500X, Honda HR-V, Mazda CX-3, and Toyota C-HR. At speed, the car responds to throttle inputs with minimal turbo lag. The biggest complaint we have from behind the wheel is the noise level. At idle, the car is relatively quiet. Once you get moving, there’s a notable amount of wind noise, especially coming from the mirrors. It’s not blaring, but it’s not as good as some of the competition. We’ll reserve judgment until we can get some real seat time in the Kona. We had no opportunity to test things like active safety with the heads-up display, cargo space, or back-seat room. There simply wasn’t the opportunity. As it stands, the Kona seems to have a lot of potential to be a class leader. Just hope that Hyundai doesn’t change it too much for us Americans.